The UK government has announced that they'll give me up to £5000 towards my first electric or hybrid vehicle sometime in 2011. Very nice. Thank-you very much. Of course, if I'm going to go green, I want to be sure it's 100% leccy and the only leccy car to go for is the Tesla Roadster (the red one) with its sub-4 second 0-60mph, limited top speed of 125mph and range of about 220 miles. Sadly, with the government's £5000 donation, I'll still be a long way off from the £87 000 needed to buy a Tesla Roadster when they arrive in the UK. 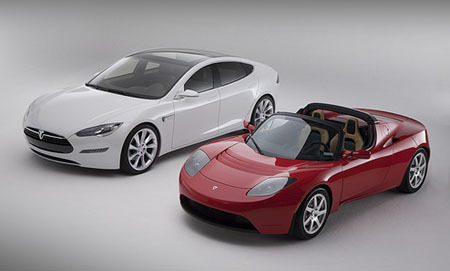 That said, if I start saving now, maybe I'll have enough for the larger Tesla Model S (the white one) when it launches in 2011 in the US and 2012 in the UK. The US price is expected to be $49 900, so the UK price won't be far off. For the time being, I'll stick to my petrol Golf GT and start collecting really long extension cords - there aren't many charging points near work or home, so it'll be needed.